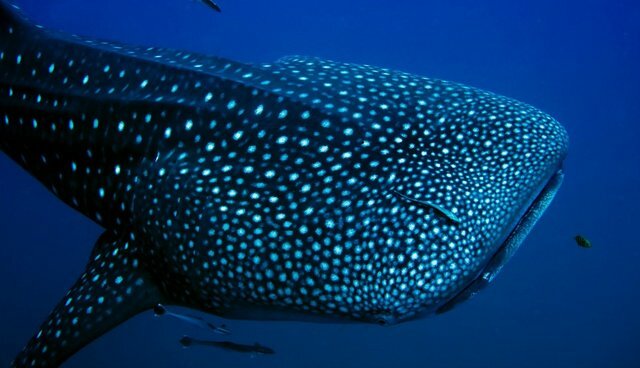 WildLifeRisk, a Hong Kong-based conservation group, has discovered a factory that processes approximately 600 endangered whale sharks each year, following a four-year-long undercover investigation of the plant. According to the group, the south China factory is the world's largest slaughterhouse for whale sharks, whose livers contain oil commonly used in health supplements. "How these harmless creatures, these gentle giants of the deep, can be slaughtered on such an industrial scale is beyond belief," Paul Hilton and Alex Hofford, WildLifeRisk's directors, wrote in a report. "It's even more incredible that this carnage is all for the sake of non-essential lifestyle props such as lipsticks, face creams, health supplements and shark fin soup." In WildLifeRisk's undercover footage, the factory owner -- identified only as Li -- said the plant also processes blue sharks and basking sharks, producing nearly 220 tons of shark oil between the three species each year. Investigators also learned that Li exports whale shark skins and dried fins to European countries such as Italy and France, where they are used in Chinese restaurants. In one segment of the video, Li says he has to "smuggle" the skins out of China, as exports of the creatures are monitored by authorities. WildLifeRisk is calling on China to shut down Li's operation, as whale sharks are classified as endangered on both the IUCN Red List and the United Nations CITES Appendix II, to which China is a signatory. While it is unclear if mainland authorities will comply with the group's petition to close the factory, Hilton expressed optimism about the possibility of a shutdown. He says that China's recent decisions to crush over 6 tons of ivory and ban shark fin soup at official banquets indicate a more positive attitude toward conservation on the mainland. Biodiversity loss and the extinction of rare species are one of the most important environmental problems today. Endangered species are identified by the IUCN Red List, the most comprehensive inventory of the global conservation status of species in the world. Using the Red List's extensive database, you can search a particular species, location, habitat or threat, and learn more about issues facing threatened species and how to help. WWF has a great list of ways to help save endangered species, like buying sustainable seafood, not buying "bad souvenirs" and fighting climate change.